It's gonna be Lunar New Year in just five days' time! After five long years, I'm finally back to celebrate this festive season that I love so much. I love the feeling of humming to CNY songs, feasting on yummy goodies, dressing kids up in cheongsams and plaits, going around saying "Gong Xi Gong Xi", gathering as a family and lao yusheng while shouting out those auspicious wishes at the top of your lungs. Talking about yusheng, I'm not sure if everyone knows how to write the saying "Nian nian you yu" using Chinese characters. No, actually I'm pretty sure some people will still end up writing "年年有鱼", literally meaning year year got fish. Which isn't that wrong either because having fish to eat every year is probably a good sign, though fish can vary from shark fins to ikan bilis. Anyway, the correct writing is "年年有余" which symbolises abundance through the year and is a good sign of prosperity. 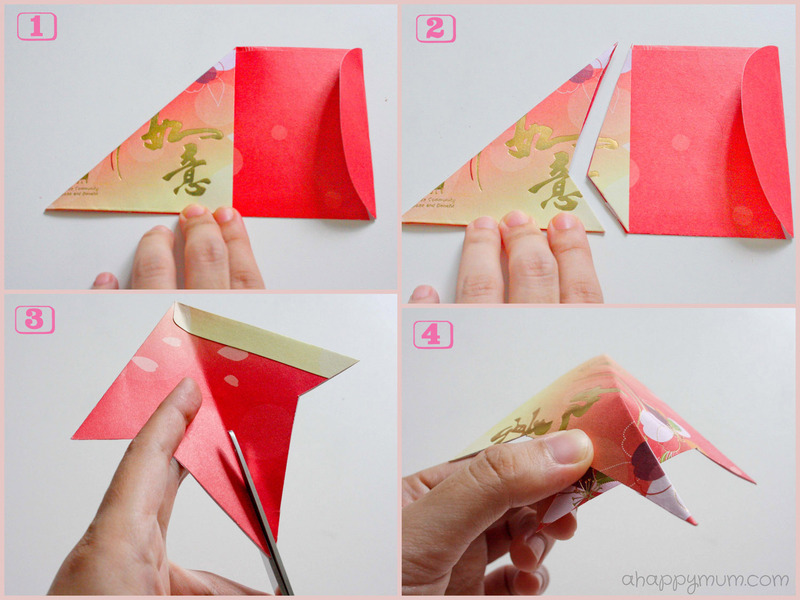 In this week's Creativity 521, I'm doing a very simple CNY decoration using nothing else but ang pows. And though I would love to make snakes and stick them all over my wall, I figure out they might scare my kids and so I'm sticking to the traditional, auspicious fishes instead. The small fish are pretty easy to make and many of us have probably done them as a kid. Just to refresh your memory, here's how you do it. 4) Cross the two sides of the tail, staple it and it's done! Now moving on to the big fish, which isn't that difficult too but just takes a little more time. And ang pows. And staple bullets. You will need 18 ang pows of the same size to make one fish. Remember to seal them up first. 9) Stick them on the top of the fish to form the fin. Repeat for bottom. 11) Insert it into the opposite end of the octogan from the mouth. Repeat 10) and secure another L-shape such that you get two layers for the tail. And we are done! Once you get the hang of it, you can actually finish one in less than 15 minutes. You can also draw on the eyes, use blu tac to stick the fish onto your wall or string it at the top and hang in the house! 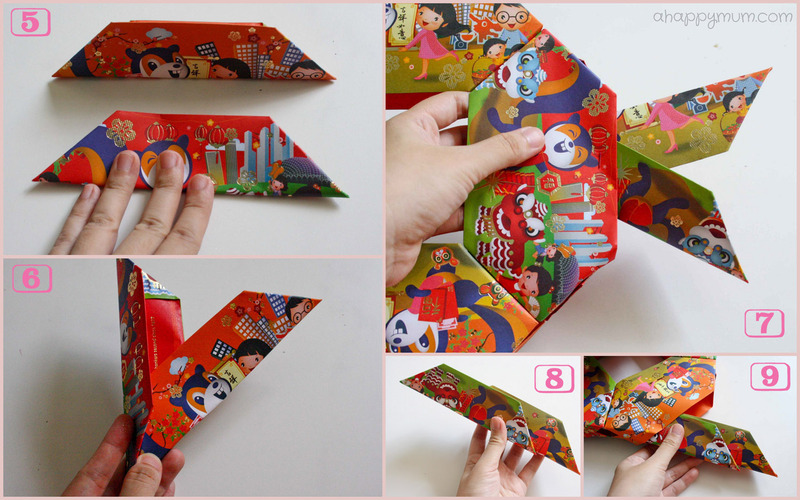 If you have a little helper around to help you fold the ang pows, it takes even a shorter time! Or maybe, it might take double the time if they end up folding the wrong way or snatching the stapler from you. Like what mine did. Still, Angel had fun learning how to use the stapler and it was her idea of doing small fish to accompany the two big fish that we did at first, which she proudly proclaim "This is Mummy fish. That is Daddy fish." And after we did the small fish, she smiled and said "And here are Angel and meimei." So, what are you doing for CNY this year? Do link up any fun crafts or ideas! Wishing all readers a prosperous Year of the Snake! May you and your family stay healthy, loving and of course, happy always! Happy new year to you! I'm hoping we can go into Chinatown to see the dragon. WOW!!!! that is amazing! Happy New Year!!! those are beautiful! happy Chinese New Year! 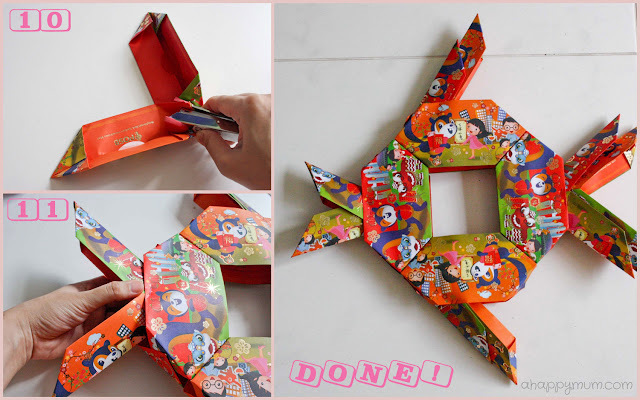 omg, this craft tutorial brought back so many childhood memories! 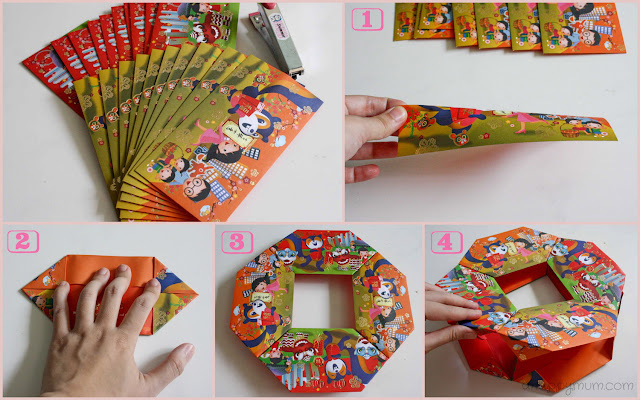 haha we used to do lotsa angpow crafts in schools. hehe that last picture of Angel is super cute! She looks so happy! This is a great idea. I need to start considering ways to introduce CNY to my girls. It was so much easier when I spent part of my childhood in Singapore. CNY was everywhere. Not so easy in Australia though there are events. I wonder if it's easy or tough in Sweden to celebrate CNY. Lovely to visit your little blog and meet you, Summer. Visiting from IBOT. hahaha, this is too funny and true about cheongsam!